The Film Simulation tool can change the look of a photo to match a film stock with a single click. The Film Simulation tool allows you to match the colors of a photo to a reference image with a single click. This tool requires the use of reference images in the HaldCLUT pattern, in either PNG or TIFF format. Each HaldCLUT image corresponds to one "look". Though the look can be based on anything, most of the reference images we ship are based on classic film stock, ergo the tool's name. RawTherapee needs to be able to access these HaldCLUT images in order that you can use the tool. You can download our collection, called the RawTherapee Film Simulation Collection, or you can design your own - more on that later on. The first time you run this tool you will see a message informing you that you need to point RawTherapee to a folder which contains the reference images. Once you have them ready in a folder, go to "Preferences > Image Processing > Directories" and set "HaldCLUT directory" to the appropriate folder. RawTherapee will scan the designated HaldCLUT folder every time you start the program, that's why it is important that you create a folder which you will use only for storing these HaldCLUT images and nothing else, so that RawTherapee does not waste time scanning unrelated files. As a safety measure, you will be warned if scanning the folder on startup takes more than 10 seconds. Should that happen, just click the button in the popup to stop the scan, then go to "Preferences > Image Processing > Directories" to see which folder is being used, and either point RawTherapee to a folder which contains only HaldCLUT images and nothing else, or to an empty folder if you don't want to use the Film Simulation tool. To give you an idea of how the startup time is affected, the difference between having 0 images in the HaldCLUT folder and having 500 images in it (that's more than in our collection) results in a 100ms startup time difference - that's nothing. If, however, you were to accidentally tell RawTherapee that the HaldCLUT folder is C:\Program Files (x86), then the startup time could even take several minutes, as that folder contains hundreds of thousands of files. As you can see, there is no reason to worry when using HaldCLUTs as long as you use a dedicated folder as suggested, keeping only HaldCLUT images in it. The level 12 Hald_CLUT_Identity.tif image. The Film Simulation tool uses specially prepared images in what is called a HaldCLUT pattern. "CLUT" means "Color Look-Up Table", while what "Hald" means is anyone's guess. 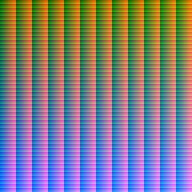 A HaldCLUT image contains a set of gradients of various hues arranged in a matrix. The neutral, unaltered state is called an "identity HaldCLUT image". Applying an identity HaldCLUT to a photo will result in no change at all. To create a "look", the identity image is opened in an image editing program - any image editing program - and the colors are modified in some global way, for example using levels, curves, adjusting hue and saturation, etc. Only global adjustments such as the ones listed should be applied - local adjustments are incompatible with how this works; for example you cannot make a HaldCLUT image give a tone-mapped look, it cannot denoise, it cannot sharpen, but it can make skin tones look more tan, and foliage more vibrant. Though the HaldCLUT image looks like a set of gradients, what it really is, is a graphic representation of a matrix of numbers. These numbers are the "out" or "result" values. The "in" or "source" values are known to all programs which support HaldCLUT images. These programs known that a pixel at position x=143 y=0, for example, should be pure red, RGB=(100%, 0%, 0%). If you edit the identity image and change that pixel to be less red, say more orange, then save this modified identity image as a new HaldCLUT file, then whenever you use that file RawTherapee will make the same change to all pure red pixels. This means that if you want to make a certain shade of red more orange you don't need to edit boring numbers to accomplish it - you just open the HaldCLUT identity image in an image editor such as RawTherapee or GIMP, adjust that shade of red (or, more realistically, perform some global adjustment which affects all colors or all shades of red, such as though manipulating RGB curves), save the HaldCLUT image, and then use it in RawTherapee on any photo to repeat that same adjustment. It should not make a difference what color profile is assigned to a HaldCLUT image. What matters are pixel values, because, remember, a HaldCLUT image is just a matrix of "out" numbers. "Assigning" a color profile does not alter stored pixel values, but "applying" or "converting" does alter stored pixel values, so don't do that. Having said that, the assigned color profile could have an influence, because an image editing program might change the working space depending on the assigned color profile. Color transformation precision depends on the number of levels (columns) in the HaldCLUT image, and on the bit depth used to store the HaldCLUT image. If working on a 32-bit image (or an any-bit image in 32-bit space) using a 12-level HaldCLUT stored in an 8-bit file, for example, the HaldCLUT stores color values with less precision than your image (or your working space) can store. This should not be a problem though, as unknown colors are interpolated from known values, so posterization should not occur. The bit depth of the image format you use to store the HaldCLUT depends on your needs, and is not strictly related to the number of levels the HaldCLUT contains. Photographers will be fine using 8-level HaldCLUTs stored in 8-bit images even when processing higher bit-depth photographs. If you need to generate your own identity HaldCLUT, do not use the program for generating HaldCLUT images from www.quelsolaar.com as it has a bug which causes issues with highlights. Use ImageMagick or GraphicsMagick instead. You can of course use the identity file we provide here - it is bug-free. This section explains how to put the HaldCLUT identity file to use so that it reproduces a specific rendering of color and lightness. 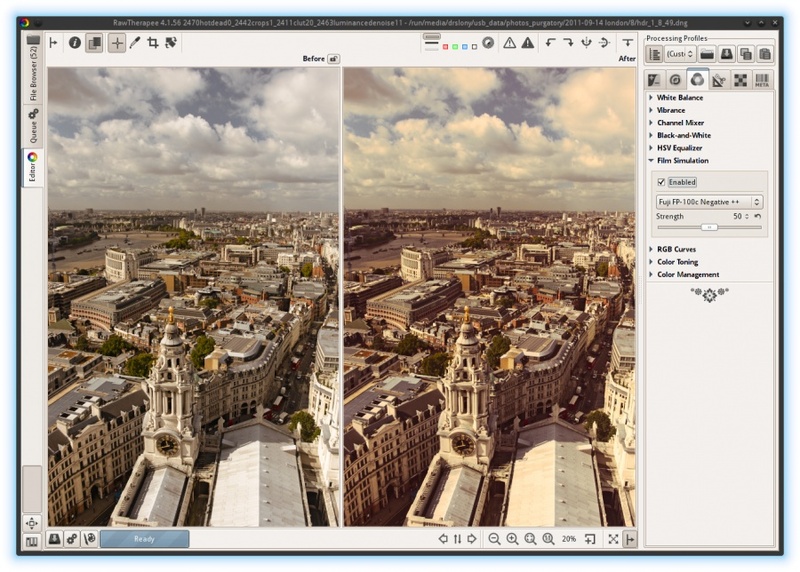 Open a photo in RawTherapee or some other image editing program and tweak it to your liking. Remember that the Film Simulation tool can only reproduce global tonal changes, so make no local changes - no local contrast, no tone-mapping, etc. ; make no changes which move pixels - no distortion correction; use no sharpening or noise reduction; make only global tonal adjustments - color and saturation changes, curves, levels, L*a*b* adjustments. Save the sidecar file or write down the changes you made so that you can reproduce the changes in the next step. Open the identity HaldCLUT image in the same program and apply the same sidecar file or re-do the same tweaks as you did in the step above. Save this image as an 8-bit sRGB TIFF or PNG in the HaldCLUT folder you pointed RawTherapee to. It's now ready for use. Restart RawTherapee so that your new HaldCLUT appears in the list. Even if your HaldCLUT image contains colors in only 8-bit precision, missing values will be interpolated so that posterization will not occur in your photo. As such, since there is no visual loss of quality, we recommend using the level 12 identity file, or even an 8-level one, and storing your self-made HaldCLUT images in an 8-bit per channel PNG or TIFF file. The color profile assigned to the saved HaldCLUT image does not matter. What matters are the pixel values of that image. You may be familiar with the terms "assign color profile" vs "convert to color profile" from GIMP or Photoshop - which color profile is assigned does not matter because it does not alter pixel values, but converting matters because then the pixel values change. When editing the HaldCLUT image in RawTherapee, the choice of output color profile matters because it alters pixel values of the saved image. As the identity image provided by us or generated according to our recipe uses the sRGB primary chromaticities, so you should use RTv2_sRGB or RTv4_sRGB when saving it in order to preserve the colors. If you apply this HaldCLUT to a photo in RawTherapee and the photo unexpectedly and unintentionally becomes considerably darker or lighter than it should have, then it's likely that the program which you ran it through did something with the gamma. To remedy, you have to undo what that program did. Try generating your own 12-level HaldCLUT but instead of using the "sRGB" colorspace use just "RGB". This is experimental, it may or may not work. Raw editing programs will discard a certain number of pixel rows and columns from the image edges for technical reasons to do with demosaicing. How many rows and columns get discarded depends entirely on the program. You need to figure this out. A 12-level identity HaldCLUT will have precisely 1728x1728 pixels. When you process that CLUT in a program whose color effects you're trying to emulate, the saved image must have precisely 1728x1728 pixels. Since you're fooling the program into thinking it's working on a raw file, and since it will probably discard some pixels around the edges, you need to figure out exactly how many rows and columns of padding are needed and add them around the image. RawTherapee cuts off 4 pixels all around when reading demosaiced DNG files, so the command above first adds a 4 pixel row and column to the bottom and right edges, then another 4 pixel row and column to the top and left edges. When you open this image in the target program, zoom into each side's edge and figure out whether you need to add more (or remove some), then modify the command accordingly. Once you have the borders figured out, merely open this DNG in the target program and follow the steps above in the "Make your own" section. There are many HaldCLUTs in our collection, and you will probably want to try them all out. You don't need to click on each one with the mouse! There is an easy way of checking them all out, one by one, which requires no mouse work. Assuming you had already set RawTherapee up to point to the HaldCLUT folder and you have a photo open and the Film Simulation tool is ready for use, just select any HaldCLUT image using the combobox, and use the "up" and "down" keys on your keyboard to apply the previous and next one. Using this trick, you can even jump across sub-folders - for example from Black-and-White to Color if using our collection. If you would like to compare the effects of several specific HaldCLUTs, and they are not consecutive in the combobox, an easy way to switch between them is by taking a snapshot after applying each, and then just clicking on the snapshots. This archive contains a collection of film simulation HaldCLUTs which you can apply to your photos to instantly match their colors to the film stocks the HaldCLUTs are based on. Unless otherwise noted in the filename, they are all in the sRGB color space, 8-bit per channel, in the PNG image format. Most of them are designed to mimic the results of various film stocks, pushed and pulled in various ways or faded over time. The suffixes +, ++, +++, -, --, --- refer to the strength the film was pushed or pulled during development (non-linear), and "generic" refers to the film type usually sold for rebranding. Added the "CreativePack-1" color collection. Converted all TIFFs to PNG (except for the identity image). The identity CLUT had a bug causing cyan colors in the highlights, it has been replaced with a fixed one. Numbered the files so they are sorted in the correct order when pushed or pulled (--, -, normal, +, ++). Re-organized into Color and Black-and-White, sub-folders sorted by brand. Expanded README.txt and added disclaimer. All images re-compressed with maximum lossless compression. The trademarked names which may appear in the filenames of the HaldCLUT images are there for informational purposes only. They serve only to inform the user which film stock the given HaldCLUT image is designed to approximate. As there is no way to convey this information other than by using the trademarked name, we believe this constitutes fair use. Neither the publisher nor the authors are affiliated with or endorsed by the companies that own the trademarks. This page was last edited on 7 December 2018, at 08:22.